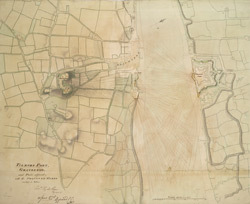 Plan of Tilbury Fort in Essex situated on the northern bank of the River Thames. During his reign Charles II embarked on a plan to reorganise and improved the national defences. Sir Bernard de Gomme the Chief Engineer and Surveyor General of Ordnance, was in charge of the scheme and he designed the new fort at Tilbury. It was fashionable at the time for fortifications to be based on geometrical shapes and Tilbury fort was based on a rectangular pentagon. During the 18th century there were alterations to the fort and this plan is part of the proposals for the work that needed to be carried out. The large powder magazines were built and the barracks were reconstructed.